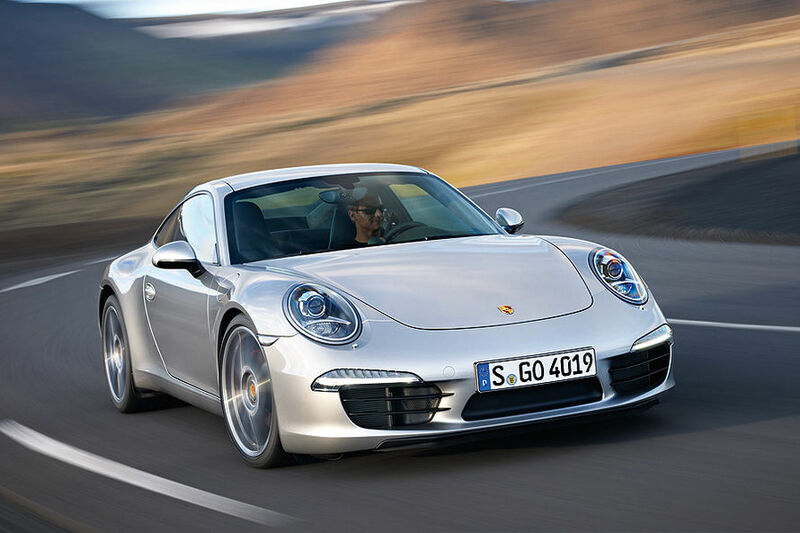 The wait is over and thanks to leaks on the web we can present to you the 2013 Porsche 911. As we have previously reported the new 911 is a tad longer than the current model, and buyers will have their choice of to new six-cylinder engines. 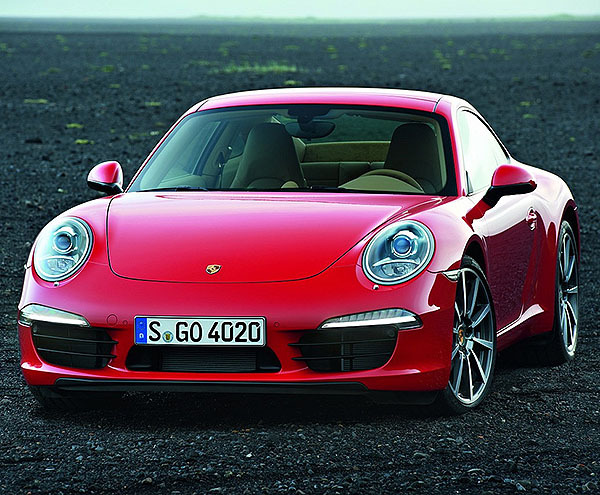 The base model Carrera will be powered by a 3.4-liter flat-six, which will be good for 350 horsepower. 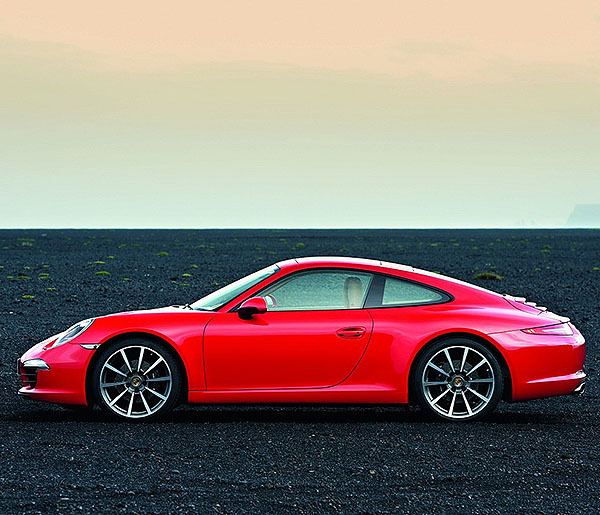 The Carrera S will be powered by a 3.8-liter flat-six, upping the ante to 400 hp. No matter which engine chosen they will be mated to an all new 7 speed manual or optional PDK dual-clutch transmission. A further development to the 911’s chassis is the increase in width of the front-track by 52mm to 1538mm. The effect on the gen-2 997 GT3 RS when Porsche widened its front track was a wholly positive one, and in the Carrera models this change should hone even the vanilla 911 into an even more responsive and involving machine. If anything, the reduction in understeer will be most welcome. The result of these chassis tweaks has, to a point, dictated the new car’s design. The front now has more prominence thanks to those wider front arches and more featured and muscular elements to its design. There is more of a cohesive look to the front of the car, the blobbiness that has afflicted the 911 since the 996 was introduced appears to have finally been addressed. There are new LED indicators and daytime running lights that look far more integrated than they are on the outgoing gen-2 997, and the new headlamps are again smaller than the previous model and are a further attempt to reintroduced the original 911’s traditional frog-eyed look. New exterior mirrors stand proud on single arms attached to the door, as opposed to the previous car’s mirrors that were fixed to the base of the side window. 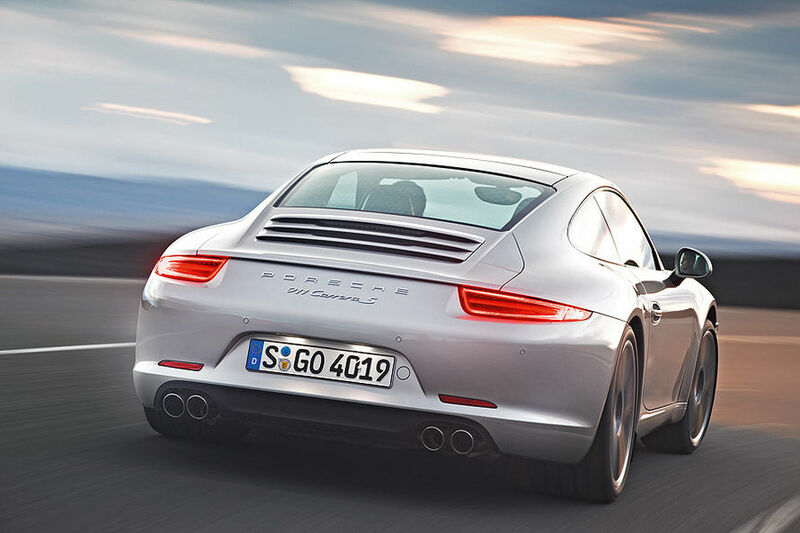 The rear of the 911 features some of the car’s biggest design changes. Along with a new bumper featuring slimmer LED rear lights and fog-lights positioned separately at the base of the bumper above the exhaust pipes, there is a new engine cover design incorporating the electronic rear spoiler. 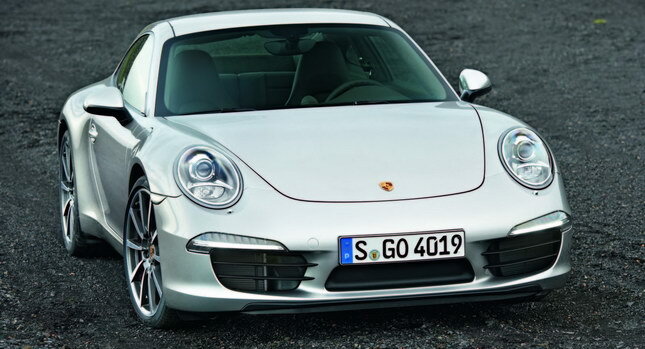 In profile it gives the new 911 an almost flat surface between the engine grille and the leading edge of the bumper. The 991’s body is constructed from a mix of aluminium-steel composite, and while Porsche claim it to be considerably stiffer and more rigid than the 997 it replaces, it is also 45 kilos lighter than its predecessor. 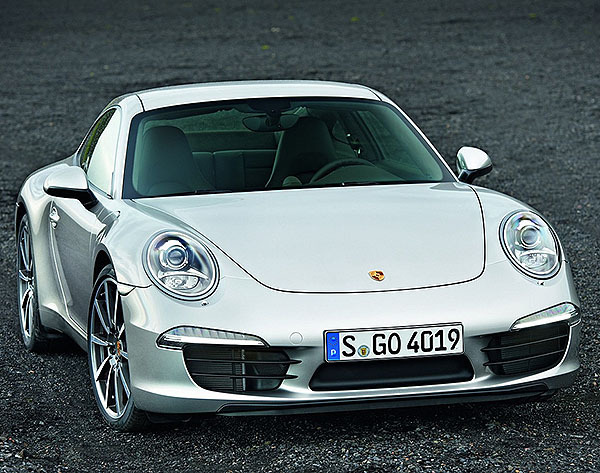 The arrival of the 991 also marks the return of the ‘911’ badge to the rump of the car. Absent since the 911 SC, the three most famous numerals in automotive history are joined by both a Porsche and Carrera badge. And an ‘S’ if you go for the bigger engined motor. 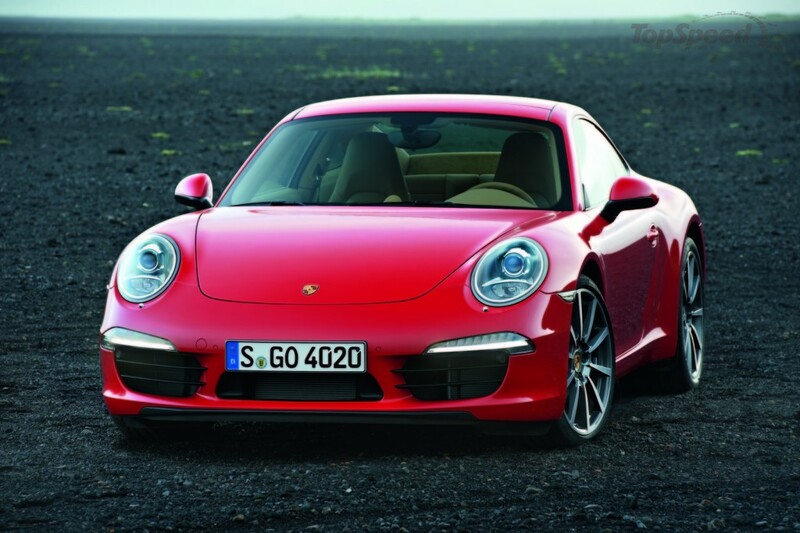 Once again the 911 will be offered with two engines of different capacities and power outputs depending on the model. The Carrera is powered by a new direct-fuel injected 3.4-litre flat-six producing 350hp, up 5hp (no officially torque figure has been announced but Porsche’s engineer’s told us it was down by around 7lb ft to 280lb ft) with fuel consumption reduced by 16 percent and emissions cut by the same level. These reductions are achieved by the introduction of auto stop/start, thermal management, and an electrical energy recuperation system. 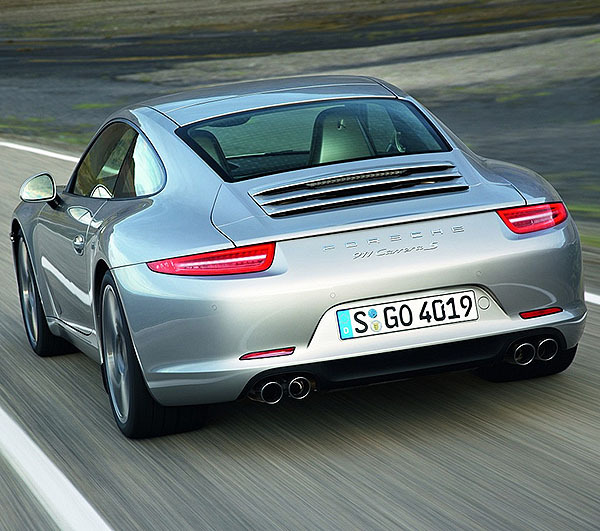 The Carrera is also the first Porsche sports car to dip under the 200g/km of C02 rate, producing just 194 g/km. A great deal of the work has gone into the 3.4 Carrera engine, it will also be used in the forthcoming new Boxster and Cayman models, and this includes new valve gear, inlet and exhaust systems and special hollow cams to improve the flexibility and free revving nature of the engine. 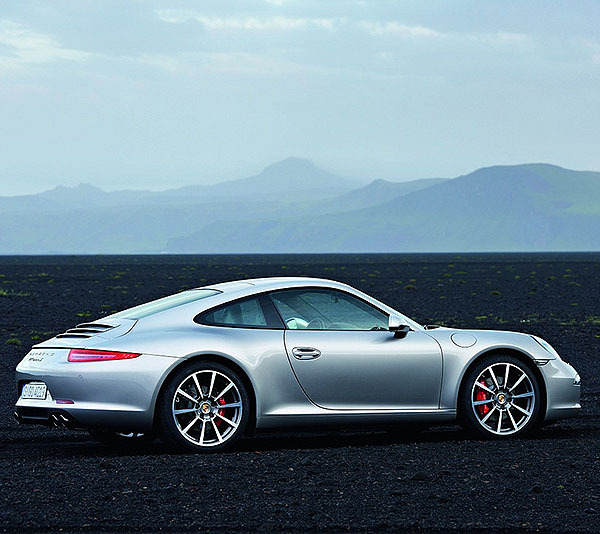 As has been the case since the 997 was introduced in 2004 the 911 will also be offered in more powerful Carrera S guise. Powered by an evolution of the existing 3.8-litre flat-six it benefits from an increase of 15hp and 14lb ft torque, taking its headline figures to 400hp and 325lb ft. The larger flat-six also benefits from improved efficiency (a 14 per cent increase in fuel economy when fitted with PDK) and a drop in C02 emissions to just 205 g/km, down from 240g/km. The seven-speed PDK double-clutch gearbox is a direct carry over unit, but benefits from new software to further smooth out the gearshifts when in wafty Drive mode, and speed them up when the driver swaps cogs manually or switches the optional Sport Chrono plus into Sport mode. The big news is that the 991’s manual gearbox will be a seven-speed unit. Yes, you read that right, Porsche has squeezed another ratio into its H-pattern manual transmission. And while it improves fuel economy and emissions it is, claims Porsche, a regular gear and not some long legged, inter-galactic overdrive. The Carrera model will once again be equipped with steel springs where as the more powerful S will have PASM (Porsche Active Suspension Management) fitted as standard. The S also comes equipped with Porsche Torque Vectoring as standard and a mechanical limited slip differential, although this is replaced with an electronically-controlled diff if you opt for Sport Chrono and PDK. As with the out going 997 you will be able to spec your Carrera with all the goodies that come free with an S.
Making it’s first appearance on the 911 options list will be Porsche Dynamic Chassis Control (PDCC), first seen on the Cayenne and Panamera. 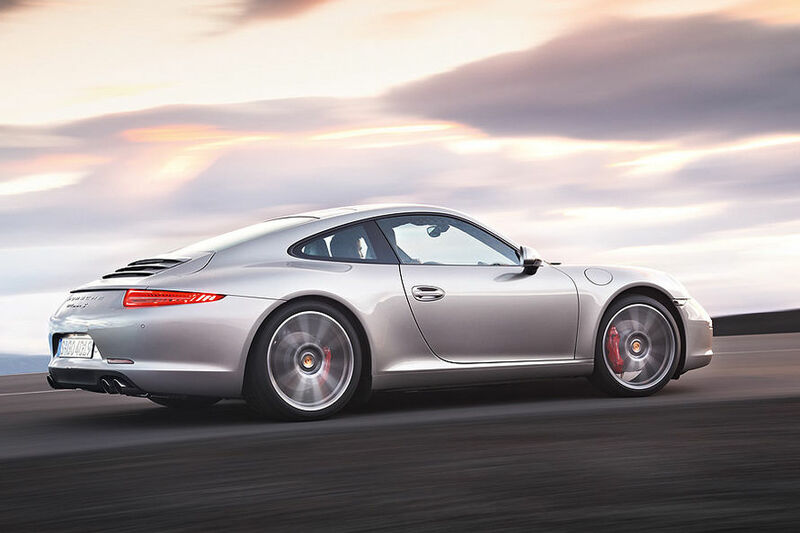 Only available, for now, on the Carrera S, the system features active anti-roll bars that disconnect when not required (driving on the motorway for example) to improve the ride quality, and reconnect when you start to the throw the car at a corner. Being active, their range of stiffness is wider therefore offering greater flexibility and control. 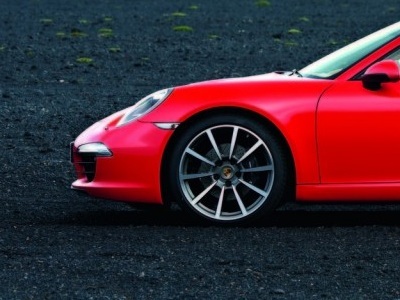 The Carrera will be equipped with 19-inch wheels and tyres, the more powerful S with 20-inch rims. As with previous generations of 911s there will be three different brake set-ups depending on your 911’s spec. The Carrera is equipped with four-piston callipers front and rear and drilled and cross-ventilated discs, with the S offering the same set-up but with larger discs and callipers. PCCB ceramic-composite brakes will be an option on both models. With the gen-2 997 being such a dynamically polished machine picking faults with it was always hard. Tyre noise on the optional 19-inch wheels was one, the quality of the interior another. Porsche’s policy of one size, or in this case, one interior fits all didn’t do it any favours; what was acceptable in a sub £40,000 Boxster and Cayman didn’t cut it in a six-figure 911. For the 991 Porsche looks to have remedied this. The door cards are an all new design, with the controls for the windows moving from the top of the door panel to below the door handle. The releases for the front and rear bonnets are still situated on the door sill. PDK customers will have a choice of steering wheels, the standard item with Tiptronic style buttons to change gear, or an optional wheel with paddle shift controls. Sports seats will be fitted as standard with the familiar range of adaptive and sports bucket seats also available. A full leather interior will be included as standard. The combination of a lighter car and more powerful engines is, as you can imagine, going to result in an increase in the 911’s performance. The Carrera 3.4 will sprint to 62mph from a standstill in 4.8-seconds, or 4.6-seconds if you specify PDK, dropping to 4.4-seconds with the optional Sport Chrono Pack activated. A Carrera S covers the benchmark sprint in 4.5-seconds for a manual gearbox car, 4.3 with PDK and 4.1 seconds with PDK and Sport Chrono. 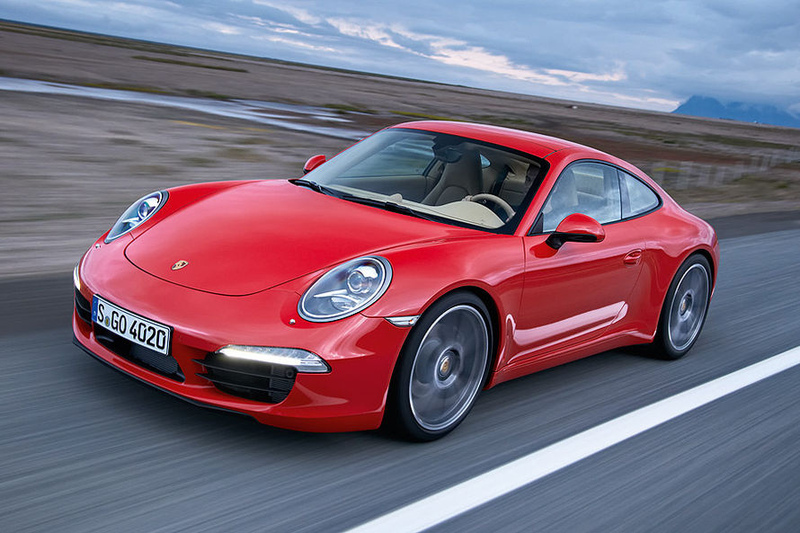 Top speed for the Carrera is 181mph, up from 179mph, with the S maxing out at 189mph, a 2mph gain. As with the 997 we fully expect these acceleration figures to be on the conservative side. Nürburgring lap times are also said to be reduced, with an as yet unconfirmed lap time that has the Carrera S lapping the hallowed circuit in an identical time to a 997 GT3. Where can I see it, when can I have one? If you’re quick you can see the new 911 in the flesh at the Frankfurt Motor Show, it runs from 13 through to the 25th September (www.iaa.de), but failing that the car will go on sale in the UK from 17th December. The Carrera will cost £71,449 (a £4179 premium over the out going car) and the S will start at £81,242 (up from £76,172). Both models will come with a chunk of standard equipment, as they should considering their starting prices. 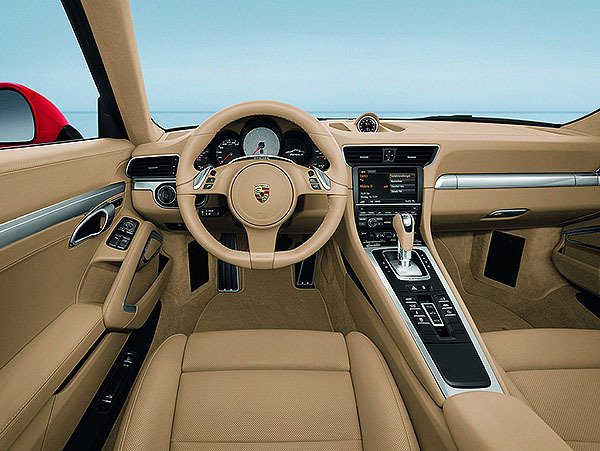 The Carrera comes with a leather interior, sports seats, automatic climate control, Bi-Xenon headlights, the 4.6-inch touch-screen Porsche Communication Management with satellite navigation, a universal audio interface, Porsche Stability Management and a three year warranty. The S adds 20-inch alloy wheels, PASM and Porsche Torque Vectoring (PTV), and a limited slip differential. Have to say, that does look nice. Front is good.... but the side is 'wrong', too much 'metal'-to-glass proportion, and the wheels are ridiculously overlarge. What's going on with the bulbous side view though? No doubt Porsche GB are having a peek at what we are saying.....so here goes. 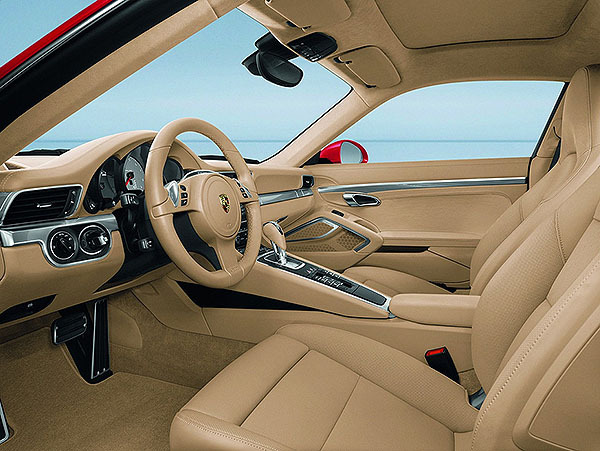 1) The interior does not suit a 911. 2) I think that 95% of the externals look absolutely fab now that we see the finished article. My two main issues are the protruding lip on the bottom of the rear bumper and those reflectors. Would I buy one? I think it's going to be an expensive new model. That pic from the side, especially in that red, is very reminiscent of a 246GT. If the back 5% was squared off they'd have just about cracked it. I reckon that it's going to be one of those cars that will look better 'in the metal' but one thing no-one can deny is that it's true to the 911 tradition. interior looks right up there with any aston/ferrari although maybe the rear lights are a bit too astonmartinish ? a sleeping fox catches no poultry ! & let the cayman & boxster have their own , think the 997/cayman/987 boxster interiors are too similar ? After reading some of the comments here, I looked at the new car again and my crest fell a bit I guess I was just dealing with the realisation that the 911 is more of a GT now than it is the compact, chunky and menacing car I fell in so madly love with decades ago. In fact, I grudgingly accepted all new models since the 993. Having gotten that off my figurative chest I think that Porsche had technical, financial and regulatory considerations influencing their decision to grow the 911. For example, that pronounced snout is probably the result of Euro NCAP meddling. With the 911 a little bigger, they can slot more models under it and make more money. Let's face it, a new non limited-edition model placed above the 911 would have been a hard pill to swallow for die-hards? I have to agree. I thought along the same lines. Imagine owning a 911, Boxster and Cayenne. I imagine one would want to see and feel a difference when stepping out of one and into the other (outside of the obvious performance and handling)? As previously quoted on 'the other new 911 thread' "Panamera-eque"
Right. That's it now, Don! Or we'll get in to trouble. 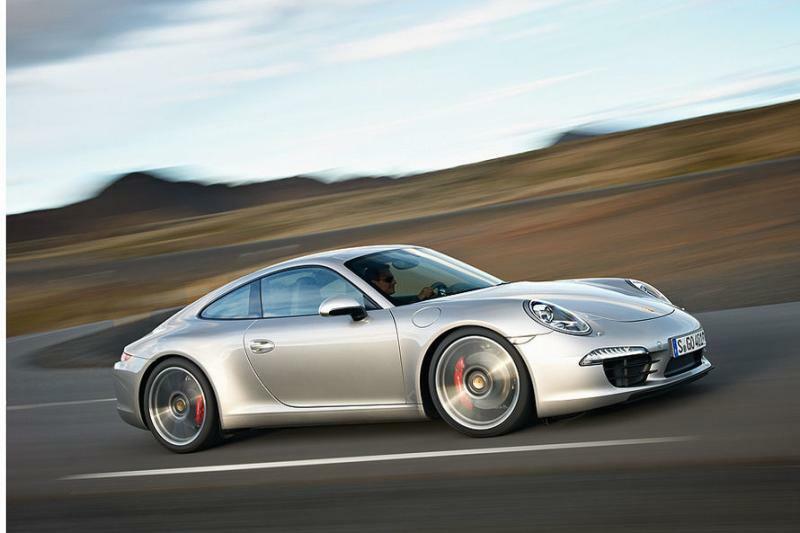 Posted: Wed Aug 17, 2011 8:15 pm Post subject: Re: New 991 Pics (Official?). Love it! No surprises; looks like a 911 crossed with the 'corporate' styling of Panamera, Cayenne, Cayman etc. Call me old fashioned or what ever.... If I wanted a Panamera I'd buy one[b].... same as the Cayenne - turned a long serving earner into a hum-drum Euro Snot box interior & WTF with the grab handle on the bottom of the door card????? What sort of diet to get it into track regime? Any word on the power plant & if a manual version is going with it?